Recent find. Already added these options to the Laguna and Monte came with them, so don't really need them. Easy to install. Will need to run your own wiring from dash to trunk for the lock. Light harness just plugs into the junction box by the trunk hinge. $85 shipped. If nobody is interested in both...or, if somebody is only interested in the trunk latch...I'd split them up. May have another light stashed away somewhere. I'll look around. Found another light...so, we're good. Steve -- I've got a trunk light but the remote trunk release would be really nice. Let me know if you're good with parting with just the release? I can see you found another light. I've got an extra one. PM sent. 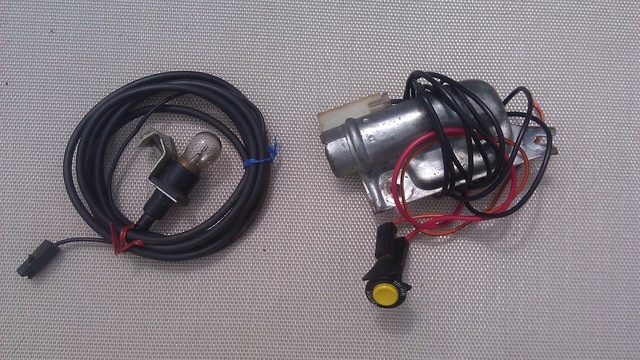 Here's an NOS trunk light listed on ebay. » For Sale "Polaris Lock and Ride roof"